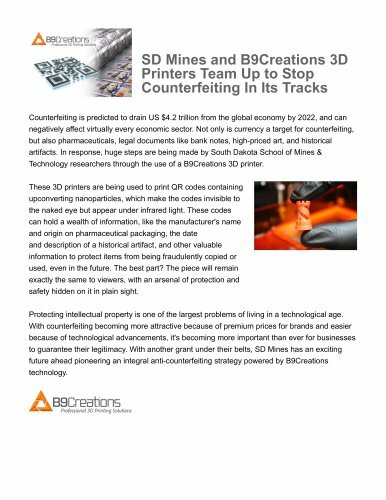 SD Mines and B9Creations 3D Printers Team Up to Stop Counterfeiting In Its Tracks Counterfeiting is predicted to drain US $4.2 trillion from the global economy by 2022, and can negatively affect virtually every economic sector. Not only is currency a target for counterfeiting, but also pharmaceuticals, legal documents like bank notes, high-priced art, and historical artifacts. In response, huge steps are being made by South Dakota School of Mines & Technology researchers through the use of a B9Creations 3D printer. These 3D printers are being used to print QR codes containing upconverting nanoparticles, which make the codes invisible to the naked eye but appear under infrared light. These codes can hold a wealth of information, like the manufacturer's name and origin on pharmaceutical packaging, the date and description of a historical artifact, and other valuable information to protect items from being fraudulently copied or used, even in the future. The best part? The piece will remain exactly the same to viewers, with an arsenal of protection and safety hidden on it in plain sight. Protecting intellectual property is one of the largest problems of living in a technological age. With counterfeiting becoming more attractive because of premium prices for brands and easier because of technological advancements, it's becoming more important than ever for businesses to guarantee their legitimacy. With another grant under their belts, SD Mines has an exciting future ahead pioneering an integral anti-counterfeiting strategy powered by B9Creations technology.